So, this is a blog of my ramblings about what I had learnt from my renovation experience of our 4-room HDB flat in Singapore. Hopefully, I manage to bring useful information, and provide a lighthearted look on the joy and anguish during this process. Under the recommendation from Alan of Venice of Italy lights, I bought the Bennington C600 Multipoint Water Heater. Why? Well, mainly because of 2 key points: (1) We're used to having "instant" water heater, and actually, my mum is worried about gas-heated storage heaters (2) I wanted to maximise the nice ready-built cold and hot water pipes by HDB. I almost went ahead to get 2 instant heaters (thereby wasting the mixer tap for the sink and only using one set of pipes, or got a storage heater (thereby incurring the wrath of my mum's constant nagging), but as luck would have it, Alan introduced me to the Bennington C600. But, really maybe my family is just having this unwarranted phobia of gas leakage or getting scaled by storage heater. I'm sure there are thousands of households using storage heater, so the track record speaks for itself. However, the idea that we don't wait 10 minutes or more to get hot water and getting back the "instant" water heater was appealing. Plus, it would feel like a 5-start hotel coz I can get the hot water at my wash basin/sink too, so why not? So, after visiting Bennington's website I decided to go ahead to buy from Alan. He even had photos from the agent or distributor to show (similar to the one I took in this blog) to tell my contractor how to do it properly. So it was a no-brainer. At the price of S$280, roughly similar to the price of 1 storage heater or similar to the price of 2 single-point instant heater, or even cheaper depending on what brand/model you buy, it was the wisest decision for me. So, after the installation was done, unfortunately, I only have one gripe. Ergo, this rambling blog. 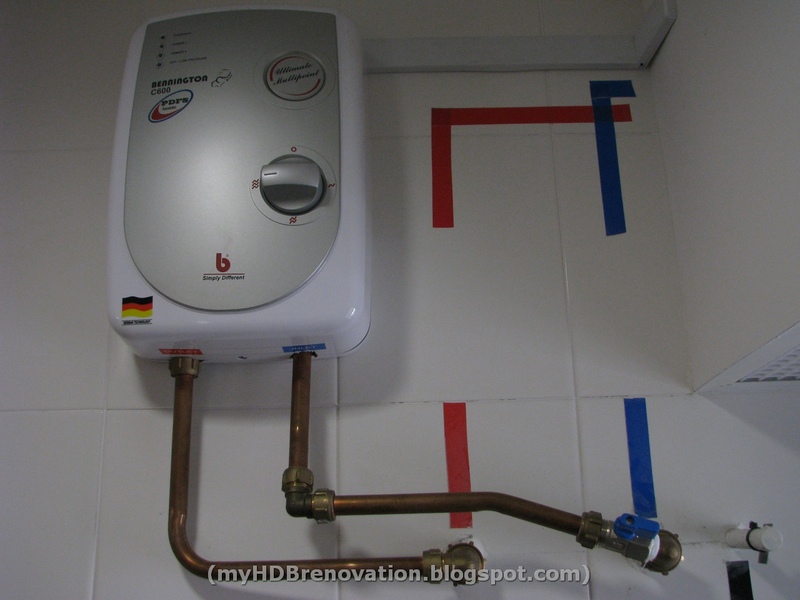 Okay, before I go further I have to say this: If you WANT hot water on demand all the time, and you WANT to maximise the piping (cold/hot water pipes) done by HDB for the new flats, then in my opinion this Bennington C600 multi-point instant heater is AS GOOD AS IT GETS! But, it is not perfect. So, I thought I should write this to help other customers acquire a reasonable expectation, so that they don't get disillusioned unnecessarily by wrong assumptions, or unreasonable expectations of this product. Because, really in my opinion, so far the C600 is a good product. Let me explain. After my contractor's plumber installed it (in the common bathroom), I tested the hot water by turning on the mixer tap in the common bathroom. I was initially surprised it took longer than my instant heater in my old bathroom shower. Sure, the water is running through a new set of pipes hidden in the wall, but I didn't expect it to take from usual say 6 seconds to now 10 to start feeling warmish, and 15-20 seconds to feel the hot water now (I later noticed it takes about 20-30 seconds to feel the hot water if its in the evening or late at night when the pipes are cooler). I didn't realize that the length of the pipes had such an impact. I never used storage heaters before, but I guess that is a good compromise to having wait 10 minutes for the hot water to boil in a storage heater. Both will have the same issue of the hot water having to transverse the pipes. So, the "wastage" of the water is the same, and I only heat what I need to use. I figured overall I'm better off, but again, I had a wrong set of assumptions initially about how "instant" the hot water is. Secondly, after the heater was installed, I noticed the water pressure from the showers had dropped a lot. I would say maybe 50%, but to be fair, I didn't really remember how it was like before as I hardly turned it on. But my impression is that surely it cannot be this low because my shower would not be satisfactory. Luckily, the solution to this is much simpler and the final outcome was good. Like I said, this product is AS GOOD AS IT GETS if you want to have the convenience of an instant heater and still have the 5-star feeling of having hot/cold water on tap. But, here I also want to highlight the very unexpected good customer service I got from them. I figured I would send in a question via their website. I didn't have high expectations of getting a reply, but lo and behold, they pleasantly surprised me by replying within 48 hours and even during the midnight time. The boss must be very "gelek"/on the ball I think. So, we corresponded via email and phone, so what happens is that their engineer will come down to my place to check out 2 possible problems: (1) there is debris lodged in the copper tank which may reduce the heating capacity. This may happen when during installation, the contractor didn't take the extra step to let the water flow to clear the debris (2) there is a problem with the HDB mixer tap (i understand from them it happens) so they will still help to troubleshoot and then I can get HDB to change out of goodwill. And of course there is (3) the heater wasn't installed properly, or it is not functioning well. So, we finally agreed I would pay a $20 transport fee if it is not heater related. Fair enough, so we agreed. I'm surprised that they would go to this length to help (yeah, its customer service, but we know in Singapore very few companies live up to this) since they didn't install for me. They truly live up to their word to "establish robust and lasting relationship with ... consumers...". I'm impressed. So, the verdict? Well, the engineer from Bennington came, and when he turned on the mixer tap, he informed me that 10 seconds is about normal, and although he only did a visual inspection of the heater from external, and tested all the mixer taps in the showers for both the common and master bedroom, he established that the installation was correct, and there is no debris in the copper tank. So, the C600 multi-point heater was working perfectly. Then I feedback about the low water pressure. He then whipped out a few smaller shower heads. He unscrewed the standard bigger one from HDB (with larger holes in the shower head) and put these standard ones that came with the other water heaters. When he turned on next, I was surprised that the water jets were gushing out with very good pressure. In fact, I would say it is excellent. Theirs had what I call 3 settings: jet/massage/mist. The hot water was spurting out very nicely with the jet setting, and when you turn to massage, the strong jets became a nice gushing frothy flow, and finally in "mist" mode, it became very fine and "misty". He proved on the spot that granted you use a small shower head, the water pressure is sufficient. In fact, I would say very strong indeed. Unfortunately, when he offered to sell me those on the spot, I couldn't decide - thought I could do better by going elsewhere coz he didn't have 2 of the same chrome colour - but later I regreted. I went to Jalan Besar to find, but none of the shops had the ones they sold. I was determined to get that, so I called them up, and they very politely told me to go to the showroom where besides choosing the ones i like, they could again take the chance to help explain the functioning of the C600. So, I'm OFF to their office tomorrow at Ang Mo Kio Avenue 10. A bit out of the way, but hey, when you treat me like a customer, I feel good going down to find out first hand from them. Seems like I can't fix the 10 seconds wait, since it is as good as it gets, but at least I can solve the water pressure issue. Will report back after my field trip with pictures of the shower heads. I'm thinking of getting this heater. How's it going after several months of use? I noticed that it doesn't have a pressure relieve valve/outlet & no mention of double relay ELCB, double thermostats like some other similar models do. I wonder if that is of concern in terms of additional safety?